This card is created for and shared on the ScrapbookPal blog. The Christmas season will soon be upon us....have you started making your gifts and/or cards yet? Well, here is a card that I created to share with you today that will hopefully inspire you to get started, if you haven't already. I was lucky enough to receive the Winter Woodland cartridge from ScrapbookPal this month. This cartridge is packed full of beautiful and fun winter themed cuts. 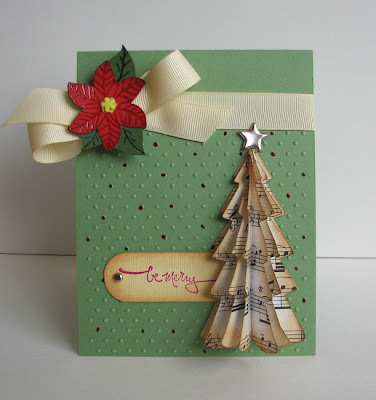 I used the 3D tree on my card as well as the poinsettia cuts. -Cut two sets of the 3D trees from the Winter Woodland cartridge at 3 1/2 inches from music paper. I find old music books at second hand stores to use in my Cricut. -Cut the poinsettia and layers from the Winter Woodland cartridge at 2 inches. -Cut a piece of cardstock at 1 inch by 2 1/2 inches and stamp a sentiment in the middle with some Cat's Eye Fluid Chalk ink. -Using some Ranger's Distress Ink in Antique Linen and Tea Dye, distress all the pieces (both sides of the tree pieces). -Emboss the bottom 3/4 of the front of the card base with the Swiss Dots embossing folder and the Cuttlebug machine. -Add some color to some of the embossed dots with Sakura Glaze Pens. Use them to add a little texture and dimension to the leaves and flower of the poinsettia, too. -Put the two sets of 3D trees together at the slots (with the top two pieces together and the bottom two pieces together, slide them so that the they all are straight). fold them all in so that when you open it, it fans out. Adhere the back two sides of the fanned out tree to the bottom right side of the card. -Add a star brad to the top of the tree. -Add a brad to the left edge of the sentiment and then adhere the sentiment to the left of the tree (I over lapped mine in the tree). -Tie a ribbon near the top and add the poinsettia to the middle of the bow. I hope that you are inspired to make some of these for your loved ones and friends. Thanks for stopping by and don't forget to enter to win a Birthday Cakes cartridge that I am giving away HERE. Awesome card! your music paper tree is gorgeous! I love the brad star, I think I still have a few left! Wow, your card is absolutely stunning!!! I love how you did the tree.. Thanks for sharing it..
Beautiful card and thanks for the instructions. That is so nice. Love the tree . Just a beautiful card! :) Thank you for sharing. This is so beautiful! I love things made with music paper! I found your site by searching for cricut blogs and I am so glad I did! Your work is awesome! I absolutely LOVE this card! Thank you for sharing it. I love this card and that tree is fantastic! Love your 3D Christmas tree ! Love this card!!! Thank you so much for the instructions. That's a wonderful idea to use the sheet music- I think I'll give it a try. TFS!! !